Financial Decisions involve making choices between various investment alternatives, with the aim of increasing the individual's net worth. The investor today is exposed to various investment options, but does not have the knowledge and capability of evaluating all the options and making a rational decision. Due to the limitation in the information processing capacities of the individuals, their beliefs and preferences, the investment decision-making process, gets biased. This chapter highlights ten such biases and throws light on how they impact investment behaviour, both positively and negatively. This understanding of investor psychology will generate insights that will benefit the financial advisory relationship. Further for Individuals, recognizing how the biases impact their financial decisions, can help create self-awareness and an understanding that would help them in better financial management, in case these tendencies are leading them to make unsatisfactory investments. When it comes to financial decision making, the thought that one comes across is that the process should follow a planned approach, since these decisions will have long term financial and emotional consequences. The long term impacts of financial decisions would enable an individual to successfully fulfill the financial goals that they have set for themselves and their family, and the fulfillment of which bring a sense of peace and well-being to the individual. The process of financial planning could be based on the individual as the key information gatherer and decision maker, or as a facilitator of decisions that are based on information that is presented to him/her. In either of these cases, it is the individual who has the choice to take the decisions himself/ herself or to allow others to take on their behalf. This choice could be self-imposed or arise on account of the inability of the individual to make the financial decisions themselves. With the tremendous growth in the financial markets the world over, an individual is exposed to a gamut of information, on which to base their decisions. This is certainly good from the point of view of making investment decisions, but is the individual actually able to make sense of this information? Can the individual take in all the information available in the market, process it, and come out with a decision that is going to maximize their utility? An answer to that would be, ‘No’. If the maximization of utility was so easy, we would not have a problem. However, in reality the situation is not so easy. The limitations that are imposed on the ability of the human mind to process such large chunk of information, in short time, forces people to make decisions based on certain heuristics. These heuristics help to process the information quickly and take decisions. But at times these heuristics can also bias the decisions. Not just heuristics, the individual is also driven by various emotions and sentiments that also bias them towards certain choices. In addition, individual may have certain motives that lead them to choose a particular course of action. Such heuristic driven behaviour, emotions and motives, bias investment decision making. The traditional finance theorists would say that these behaviours lead to suboptimal decisions as these behaviors are irrational. Unfortunately, people are not as rational as the traditional finance theorists claimed them to be. Hence the ‘rational man’ is in fact the homosapien who by the design of the human mind, is prone to biases. Much literature from evolutionary psychology gives evidence of biases as essential for human existence. Amos Tversky and Daniel Kahneman (1974) were among the first to identify the presence of psychological biases in decision making under uncertainty and risk. Some examples of behavioural biases are Illusion of control, Illusion of validity, Overconfidence Bias, Anchoring Bias, Self-Control bias, Cognitive dissonance, Framing, Representativeness, Hindsight Bias, Loss Aversion Bias, Status Quo Bias, Regret Aversion, Ambiguity aversion, etc (Tversky & Kahneman, 1974; Kahneman & Tversky, 1979; Thaler, 1980; Kahneman & Riepe, 1998; Barber & Odean, 1999; Hilton, 2001; Shefrin, 2000; Barberis & Thaler, 2003; Pompian, 2008; Szyszka, 2013). Individual investors are prone to various biases that influence their investment decisions. The literature on finance tells us that biases need to be corrected as these lead to sub-optimal decisions. But biases are actually designs of the human mind and enable people to make sense of their environment and give a sense of wellbeing. 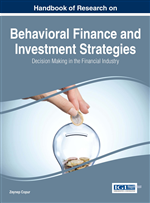 The purpose of the chapter is to understand based on the literature in the area of behavioural finance, how the various biases manifest in financial decision making; to try and understand the positive and negative dimensions of the various biases and what ways are there to enable people to overcome the negative aspects of the biases. Familiarity Bias: The tendency to make investment decisions based on the lens of: being familiar with the investment option. Regret Aversion Tendency: The tendency to avoid taking an action due to a fear that it may turn out to be less than optimal. Illusion of Control: The tendency to feel that one can influence the outcome of the decisions (which may be driven by chance). Status Quo Bias: The tendency of a person to want to stick to the investment portfolio and the investment opinion and not make any changes to it very quickly. Hindsight Bias: The tendency to see past events as being predictable (when analyzed at a later point in time).